This article presents a tour of the innovative portal for business analysts called the Business Analyst portal. This article presents a tour of the innovative portal for business analysts called the Business Analyst portal. 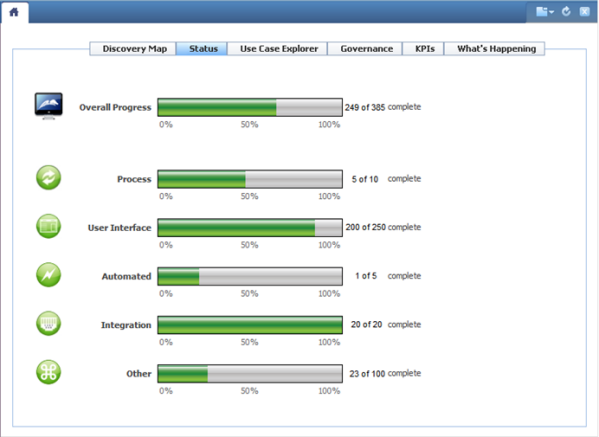 Introduced in PegaRULES Process Commander 6.1 SP2, this intent-driven portal provides quick access to those tools and wizards that are key to the business analyst's daily tasks and which increase productivity. Business analysts typically research the business benefits of developing the application and prioritize the development of those specific "slivers" of the project that provide the most benefit. (A sliver is a portion of the production-ready application that can be released to users.) To make this determination, a business analyst uses requirements, use cases, and work types to identify logical slivers of deliverables and key process improvements that, when developed and delivered, provide the desired business outcomes. The Business Analyst portal is defined by the portal rule named BusinessAnalyst, in the Pega-Desktop RuleSet. This portal supports the business analyst in this work by providing an intent-driven user interface in which a business analyst works directly with the application's requirements, use cases, and work types, and accesses tools for analyzing the application's design and behavior over time. The Home display, which provides tools to help analyze, evolve, and monitor the application's design and behavior over time. 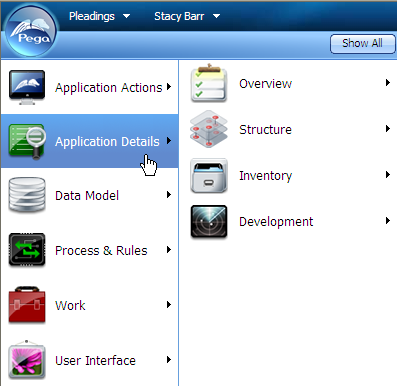 The Pega button menu, which provides easy access to those landing pages and wizards that support the business analyst's tasks. The What's Happening gadget, where you can monitor the team's work and progress in near real-time, even when team members are physically distributed. The following sections describe each of these areas in detail. 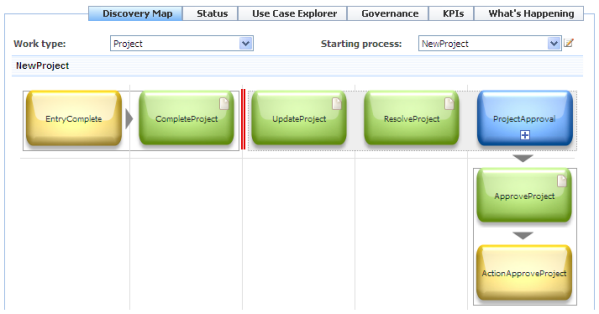 This gadget displays the current application's Discovery Map, an interactive top-level view of business process steps. From the map, you can review and optionally edit details about the use cases associated with the shapes in the map. If a shape in the map has an associated use case, you can double-click the shape to see the use case details. If the use case rule is in an unlocked RuleSet version, you can update the details directly in the Edit Use Case window. This gadget reflects the progress made to date in developing the current application. At a single glance, you get an overall sense of how much is done and how much is left to do. The displayed progress is directly tied to use cases, and is organized into five categories, as well as reflecting the overall progress for the application. 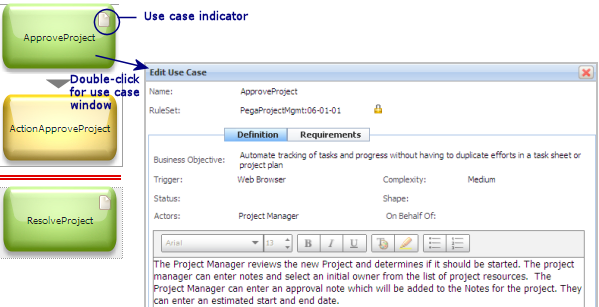 To view a list of the use cases in a category, select one of the numbers to the right of that category's progress bar. Additionally, you can further drill-down and open the use case itself by clicking on its name in the report. 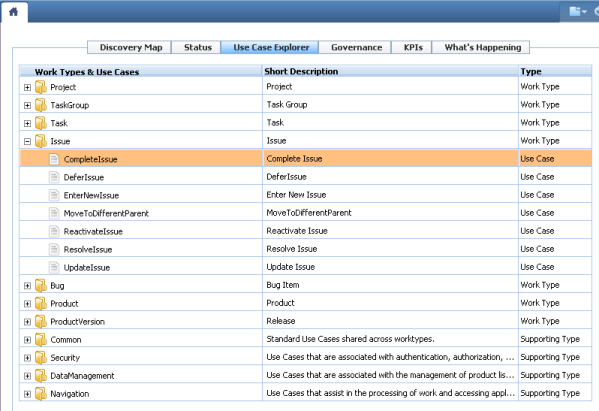 The Use Case Explorer displays the use cases by name in a tree structure, organized by work type and supporting type. Double-click the work type and use case names to open a window and review their details. If their RuleSet version is unlocked, you can edit and save the details directly in those windows. 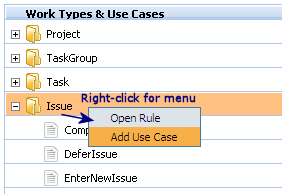 You can also add new use cases to a work type or supporting type by right-clicking the item and selecting Add Use Case from the context menu. Use this gadget to assess the current application's adherence to good design and implementation best practices (such as those codified in the guardrails). Get an initial visual sense for the level of adherence, and then use the report links for a deeper understanding of where issues lie. The reports here provide the results of several checks on the rules in the application. These checks are the same as those provided by the Application Preflight tool usually used by application developers. Whereas a developer might do a preflight check at a single point in time to check that a preproduction application is ready for production, a business analyst typically uses the Governance gadget periodically to assess how well the application is doing over time with respect to meeting good design and other guardrail criteria. With the Key Performance Indicators (KPIs) gadget, you can establish and monitor key performance indicators (KPIs) for the current application, see real-time KPI results using gauge-style charts, and analyze trends over time. By creating and monitoring KPIs, you can easily track business performance and see whether business operations and processes are meeting desired criteria. For example, by establishing a KPI to regularly track average resolution time for a customer issue, you are aware of the trend over time, and when the trend starts to indicate longer resolution times, you can take proactive steps to correct it. 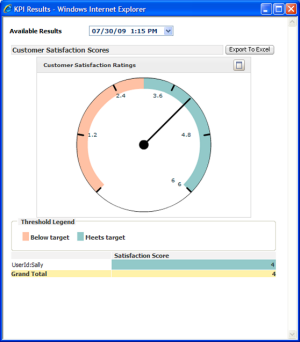 The KPIs gadget in the Business Analyst portal leverages the Key Performance Indicator (KPI) Framework. When the KPI Framework is installed and configured for your application, you can work with and view business KPIs directly within this gadget. You can create new KPIs and schedule them for periodic runs, create trend reports, and view KPI results. For more information about KPIs and examples, see Defining and using Key Performance Indicators in the Business Analyst portal. The What's Happening gadget displays the current development activity occurring in the application. In a team environment, you can use it to monitor team members' work and progress in near real time, even if they are physically distributed. Comments posted by team members. To post a comment, enter it into the field and click Post. 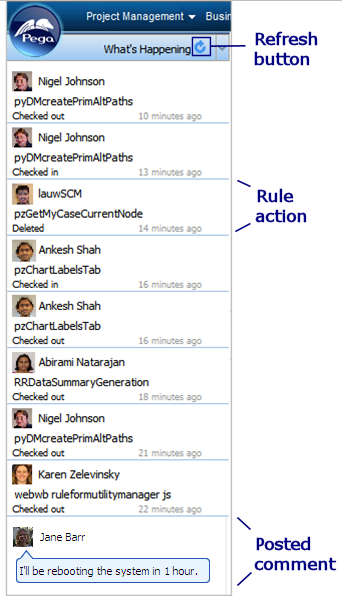 Messages are visible to team members working on the same application. Periodically use the Refresh button ( ) to refresh the contents and see the most recent messages. This information is also available in the left panel of the Business Analyst portal and while offline as a Really Simple Syndication (RSS) feed ( ). The prominent Pega button ( ) provides quick access to wizards and gadgets, grouped into landing pages. Use landing pages to quickly get to a wizard or gadget to perform a task or see relevant collected information. 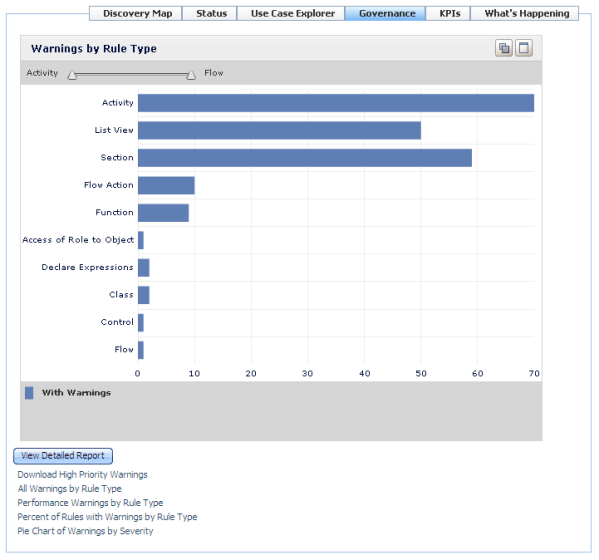 For example, select the Inventorylanding page to access the available inventory reports about the artifacts in your application. Landing pages are accessed from their corresponding menu category. 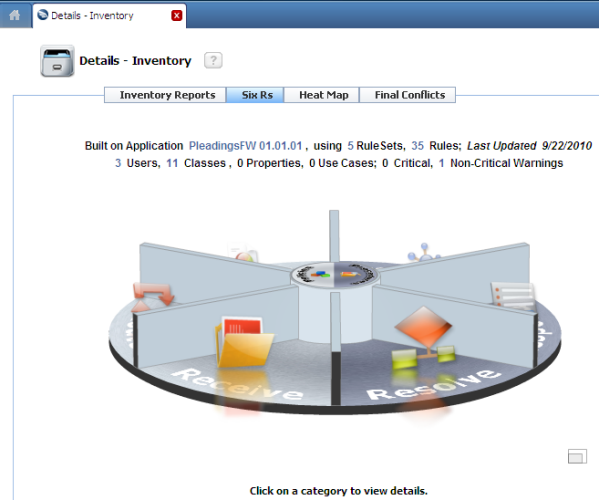 For example, in the above image, the Inventory landing page is accessed from the Application Details menu category. To review the organization of the landing pages and see all available choices, click the Pega button and then click the Show All button. Each gadget provides information; most enable easier configuration of specific capabilities in your application. 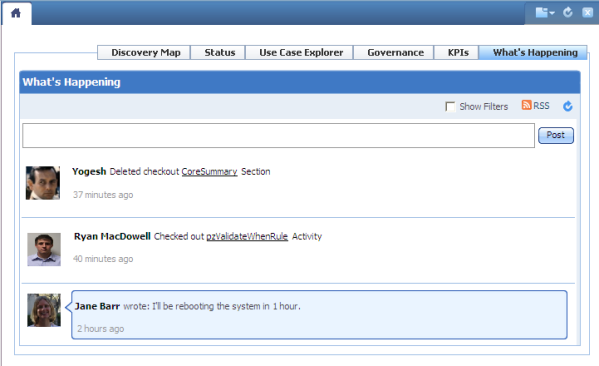 The left panel of the Business Analyst portal provides the What's Happening gadget and the Application Explorer. Use the What's Happeninggadget to track what is being modified and by whom. Messages are visible to team members working on the same application. Comments posted by team members. To post a comment, use the What's Happening gadget in the Home display. Periodically use the Refresh button ( ) at the top of the What's Happening gadget to refresh the contents and see the most recent messages. 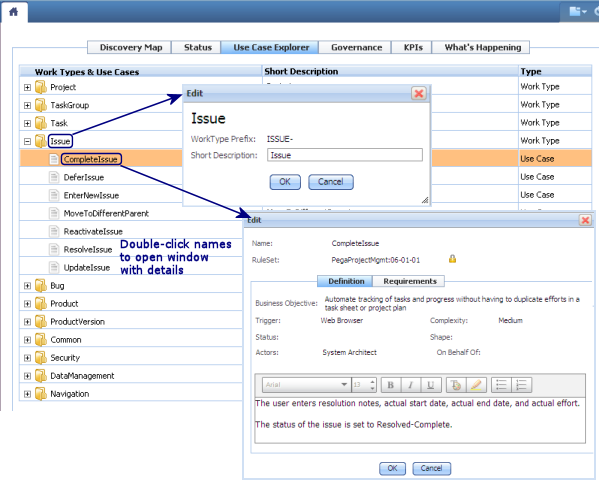 Display the Application Explorer in the left panel of the window for straightforward access to those rules that belong to your current application. 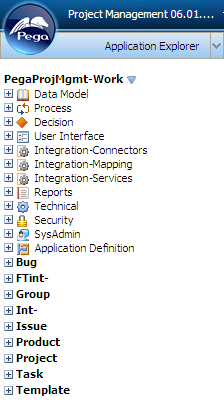 The Application Explorer displays the rules by name in a tree structure organized by category and application work type. 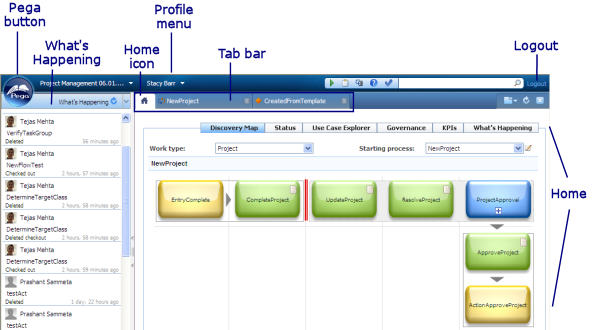 Click the down arrow at the right side of the left panel to select the Application Explorer. The header bar at the top of the Business Analyst portal window provides the Pega button and access to your user profile and preferences, the Quick Launch bar, system search, and logging out. The Profile menu displays the logged-in operator's name. Click the down arrow icon next to the name to access a menu of tools and information about the operator. Click Profile to see your operator profile and optionally change your password. Click Preferences to review or modify personal settings about the operation of the Business Analyst portal window; for example, whether to run a flow in a pop-up window or within the portal window itself. The Quick Launch bar ( ) provides icons for quick access to items such as the help system. Use the full-text search to search the system for matching rules, data instances, and help topics. The default is to search only those items in the current application and match on the item name (key). In addition to the tab for the Home display, the tab bar identifies those currently open landing pages, rule forms, or data forms. When landing pages or forms are open, tabs are displayed between the Home icon ( ) and the Currently Open ( ), Refresh ( ), and Close ( ) icons. To bring a tab to the forefront, click that tab.